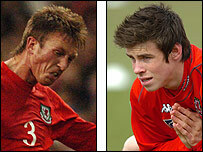 Wales defenders Gareth Bale and Danny Collins are facing a race against time to be fit for the Euro 2008 qualifier against the Czech Republic on 2 June. Bale, 17, injured his ankle during Southampton's Championship play-off loss, while Collins has a hip problem. 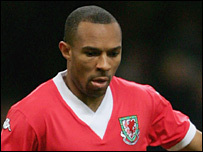 The pair will miss Saturday's friendly against New Zealand but Danny Gabbidon is expected to play at the Racecourse. The West Ham defender has not played since January after two groin surgeries but is now back in full training. Ryan Giggs is expected to play a half against the All Whites this Saturday at Wrexham and both he and Gabbidon should then face the Czech Republic in Cardiff. Blackburn goalkeeper Jason Brown has been given leave from the Wales squad due to a family illness. Manager John Toshack says he will give both Bale and Collins until the Wednesday before the Czech encounter before deciding whether to play them at the Millenium Stadium. Wales will also miss three players against New Zealand because of the Football League play-offs, with Arron Davies, Jason Koumas and Lewin Nyatanga out. Yeovil striker Davies will be involved in Sunday's League One final, while West Brom's Koumas and Derby's Nyatanga are in opposition in the Championship final on Monday. All three will return for the Euro 2008 qualifier with the Czech Republic at the Millennium Stadium in Cardiff. New Zealand had been meant to play Ukraine the week after facing Wales, but have cancelled the match in Kiev because of the unavailability of eight first-choice players. Gabbidon has had two groin operations this season, the 27-year-old having first gone under the knife in January and then again in April. Southend striker Freddy Eastwood will miss both matches as he is still suffering from the back spasms which forced him to miss the final two games of the season. The 23-year-old was set to win his first cap after proving his eligibility through a Welsh-born grandfather. Wales added Wrexham striker Chris Llewellyn to the squad last week because of the doubts over Eastwood. "Unfortunately we have had to pull Freddy out of the Wales squad," Southend physio John Stannard told the club's website. "His back hasn't healed as quickly as we'd hoped and Freddy isn't ready for kicking a football, let alone the international stage. "We're looking at another three to four weeks of intensive physio before he is fully fit." Despite Eastwood's injury, Wales are still keen for the striker to join up with the squad when the players gather at their training base in Chester. "We hope he will able to join the squad for a day or two so that the players and management can start to get to know him," said a Wales spokesman. Eastwood was one of five uncapped players named in the original squad by Toshack earlier this month - joining Wayne Hennessey, Chris Gunter, Neal Eardley and Daniel Nardiello. The call-ups of youngsters Eardley and Gunter came at the expense of Portsmouth's Richard Duffy and Wrexham's Ryan Valentine. Eardley, 18, has been virtually ever-present in League One for Oldham and last summer was touted for a possible switch to Liverpool. Gunter, 17, has been tipped for great things by Cardiff City manager Dave Jones after breaking into the Bluebirds' first team this season. Barnsley's Nardiello is included for the first time since pledging his allegiance to Wales. The England-born striker qualifies through his Welsh father Donato, who won two caps against Czechoslovakia and West Germany in 1978. Mark Delaney remains unavailable because of his knee injury, while Darren Ward has informed Toshack of his wish to retire from international football. England-born Eastwood is eligible after providing documented proof that his grandfather was born in Wales, at Pontyberem near Llanelli. The call-up capped remarkable rise to fame for the striker, who, after being rejected by West Ham, joined the Shrimpers from non-league Grays Athletic less than three years ago. Originally signed on loan, he scored within seven seconds of his debut against Swansea and went on to hit a hat-trick, the first of 49 goals over two seasons which guided Southend to successive promotions. Danny Coyne (Burnley), Wayne Hennessey (Wolverhampton Wanderers), Lewis Price (Ipswich), Gareth Bale (Southampton), Danny Collins (Sunderland), James Collins (West Ham), Neal Eardley (Oldham), Steve Evans (Wrexham), Danny Gabbidon (West Ham), Chris Gunter (Cardiff), Craig Morgan (Peterborough), Lewin Nyatanga (Derby County), Sam Ricketts (Hull), Andrew Crofts (Gillingham), Arron Davies (Yeovil), Simon Davies (Fulham), Carl Fletcher (Crystal Palace), Jason Koumas (WBA), Joe Ledley (Cardiff), Carl Robinson (Toronto FC), Craig Bellamy (Liverpool), Rob Earnshaw (Norwich), Ryan Giggs (Manchester United), Daniel Nardiello (Barnsley), Chris Llewellyn (Wrexham).